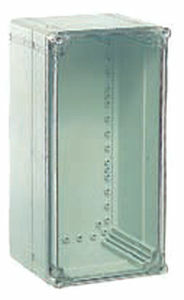 Extension frames (h 55 mm) can be mounted on series CUBO O enclosures if a deeper enclosure is needed up to 185 mm. Moreover, accessories are available that make this system extremely versatile and easy to use. All series CUBO O and CUBO C enclosures are supplied complete with fixing screws for the cover and for the mounting plate.